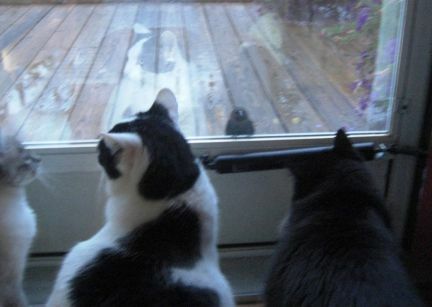 What does it mean - When a blackbird adopts you? Can you see this fellow? He seems to have adopted us. He sits at my front door all the time. Either like this photo, or he holds onto the handle and leans over and pecks at his image in the mirror. He can't see the cats or the dogs because the storm door is covered with a reflective film. I thought for the longest time he was just in love with himself. I'm still not completely convinced that's not the case. But he does also try to get in via the window, so who knows? He starts his barrage around 7:00 a.m. each morning and keeps going pretty much all throughout the day. Needless to say, he's quite the entertainment for the cats and the wigglebums. I've never been adopted by a bird before. I tried to convince him he really doesn't want inside the house, but he is not detered. He doesn't even really fly away when I go outside. I would LOVE that!! That is such a cute pic esp all three cats admiring their possible play toy. I keep hoping some birds would build a next on our tree since the same ones do seem to spend all day there. Although would be nicer if it was one of those mosquito eating birds. What fine entertainment for your gang as well! Mating season brings out the strangest behavior. For a few years we'd have a roadrunner (yeah, beep-beep) fight his reflection in the door, often until blood was let. Silly birds. That is a very funny picture, but would scare me half to death. I was attacked by red winged blackbirds in 6th grade so birds terrify me! I don't mind them in the distance but this would be too close for comfort. Well, Bye-Bye, that's what we've named him, shows no signs of moving on. He's actually been at this for several weeks now. Even as I'm typing this, he's sitting on top of the shepherd's hook, which holds up the bird feeder outside my office window, just staring inside. He's quite entertaining, and I'm not afraid of birds. In fact, quite the opposite. I enjoy watching them so I feed them and plant things to attract them to the yard. This is just the first time I've had one become so attached to me. I'm just wondering how long he'll hang around. Smart bird - he has found himself a good family In Montana, we had a pair of geese that would come back year after year and hang out at the pond. I named them Fred and Ginger and looked forward to their return every spring. Winston never got close to them - but would watch them for hours. Your little guy is a cutie!